Toward the end of my telephone interview with Bob Gabrielse for an article in the July-August issue of BizVoice magazine, he politely asked if he could quickly take another call, apologizing for the interruption. A trucking company was on the other end of the line, hoping to deliver 200 parts about an hour later. 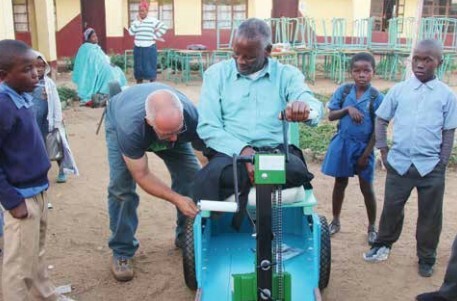 The vehicle wasn’t heading to Gabrielse’s law office in DeMotte, but to a production shop where he devotes several hours each week overseeing the work and building hand-pedaled mobility carts through Mobility Ministries. The sturdy three-wheeled carts travel from Indiana to rural areas in Africa where adults and children who can’t walk gain the freedom that comes with independent mobility – the ability to leave a hut or village without relying on another person to carry them. Unlike canes or walkers, these units also have an area for goods or packages. Since opening the first facility in 2011, DeMotte Mobility Ministries has become a bit of a leader among the affiliate Mobility Worldwide locations, says Gabrielse, who is currently working to develop a prototype that’s lighter than the current model, making it easier to pedal. He and Arla, his wife of 45 years, manage the shop. Both have played a major role in the DeMotte facility from the start after Bob read about this type of work in a magazine from Calvin College in Grand Rapids, where his kids had gone to school. He tells me how he got involved, which also reveals a connection to previous overseas charity work. With a schedule of seven or eight units a week, volunteers at the Indiana location now produce 350 to 400 a year in the current 7,200-square-foot production space. It is a ministry, especially for Gabrielse. The latest and greatest technology is not only sometimes unnecessary, it may even be unhelpful. Not only does it take better infrastructure to support technological solutions, but simpler, cheaper options may be more practical. For example, these basic carts may be more rugged and easier to repair than a motorized chair would be, even if it could withstand the roots and uneven surfaces. It’s a good reminder that when looking for a solution or result, be sure it’s sustainable and suitable. Don’t underestimate what you – with the support of your community – can do. In this case, one person read one magazine article that offered a solution to a problem. Through hard work and commitment, that led to a team of retirees joining together to improve the lives of hundreds of others 8,000 miles away. That’s pretty amazing. For Gabrielse, helping others is a calling, and he also brings that dedication to his legal practice in a small town of 4,000. The other attorneys I talked to about practicing law in small communities also stressed the ability to help others – especially where they lived – as a gratifying part of their work. 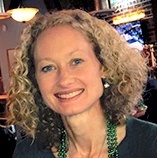 Crickett Gibbons is the communications specialist for the Indiana Chamber. She is also a writer for the Chamber’s award-winning BizVoice magazine and has been with the organization a year.